I was thoroughly miserable on Wednesday because I am unwilling to give in to my landlord's rule that we must rent an air conditioner from his company and then pay an additional fee for its installation. In disgust, I then went to downtown Chicago and proceeded to sweat through my linen suit because the air conditioning was turned down in my office. I wandered about and a friend picked me up and drove me to get Chinese food. I was hot, grumpy, and my yummies from Joy Yee's did not make me smile. What a crappy day. All was wrong. Now I know why. My malaise is not related to the heat and lack of A/C throughout my overpriced apartment. No, it is an existential conditional related to my negritude that is best captured by the unit of measurement known as the British Thermal Unit (BTU). I was not privy to this fact until my daily read of Constructive Feedback's (a fixture in the black blogosphere) website. 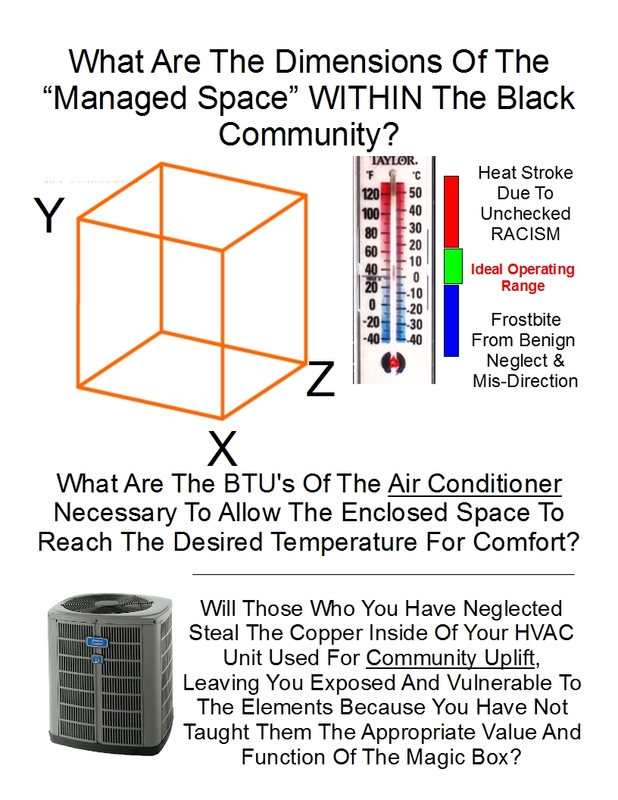 I am moved that the black community's perpetual struggle with the ghetto ign't classes, structural inequality, and colorblind racism in the Age of Obama can in fact be reduced to an air conditioner analogy. Forget a check in every bank account, or a turkey in every pot, we need air conditioning as the vanguard of race and class progress in this time of the Great Recession. Constructive Feedback's model is a great heuristic and metaphor for diagnosing all that ails us and by extension--because black and brown folks are the miner's canary--America. I say this without snark, meanness, or irony. Ultimately, I give love where deserved. Constructive Feedback gets a good deal of well-deserved hate and is an object of thrown uncleaned chitterlings innards towards the back of his head at the black family cookout at the beach. The beta in the wolf pack, he is abused because his suffering diffuses conflict among the group. Nevertheless, we ought to acknowledge the role he plays in maintaining harmony. In this moment, Constructive Feedback deserves some love for his air conditioning/BTU/black empowerment moment of wit and genius. As a Klingon once said to Captain James T. Kirk, Constructive Feedback I salute you! My friends, on a Friday, and in the interest of friendship, please share your thoughts on why you too love Constructive Feedback's air conditioning analogy. If you were going to piggy back on Constructive Feedback's BTU/AC analogy for all that ails black folks and America (more broadly) what metric to appliance relationship would you use? As a firm believer and now seasoned practitioner in the overarching imperative for us all to exponentially increase our tangible material competencies, I believe that maximizing and culturally enshrouding the knowledge, skill, and abilities associable with being Fremen-efficient, is the most viable path available to the broadest mass for economic and cultural development. Michelle Obama is clearly our Jessica Atreides - versed in the Bene Gesserit arts - and embroiled by marriage in the ongoing scuffle for control over the all-important jes grew. Brother Feed jes needs a little time out in the high desert, imbibing mass quantities of the all-important spice jes grew. Unlike that spooky pretender Cain, I've long believed that Brother Feed's heart is in the right place, he jes highly alienated from the all-important spice. I have always offer up the perspective that CF was worthy of attention despite his frosty demeanor.. I expect his thermostat to spike upon the recognition he has received from CD and Me..
Have you ever had a neighbor who you suspect is the person who has smashed out the windows in your house - mostly because the only ones that are broken just happen to be on the side facing his home? Then when he offers you a Thanksgiving turkey, fully cooked and dressed - because he is operating in the spirit of "Philos" that the season has brought forth in him? This is my sentiment of your present gesture. So let me say THANK YOU SIR. However - as I replace my windows and then put up a surveillance camera on that side of the house - in the spirit of "Trust but Verify" - your sentiments will express themselves over time. MLK ALSO had refuse thrown at him. The parallel is NOT in my attempt to assume his "greatness" - instead we have the case that ENTRENCHED PEOPLE don't like being "agitated". TO THE CONTRARY, Mon Aimes, what you characterize as ONE "Alpha Wolf" I see as a "Wolfpack" who operate as "attack sheep dogs" - grabbing any "wayward sheep" who dares speak out of turn on the back of his neck. This is done as publicly as possible NOT for the sake of punishing that individual but more so to show all the others standing in the pack the consequences of getting out of line as prescribed. Mr DeVega - since we are all getting a bit "sentimental here" (No Homo :-) ).........what I desire the most is the establishment of a TRANSPARENT system of governance that ALL OF US are made to YIELD to as we proclaim to advance the "Black Permanent Interests". I actually have less problem with "Progressivism" than I do the "steamroller effect" that is allowed as the VOID in governance of our "Community Consciousness Core" is filled by those who know how to manipulate Black people by exploiting our sensitivities. Please come over to my family dinner and sup on some of the turkey that you have so graciously provided to me. I would like for you to eat the first slice of your nourishing entree. I AM NOT YOUR ENEMY!! @Constructive. I would gladly eat the meal I prepared for you. I have now pulled out the chair at a tasty banquet twice. But, you refuse my generosity? Why is that? "...I am unwilling to give in to my landlord's rule that we must rent an air conditioner from his company and then pay an additional fee for its installation." Uh, THIS is legal? Just because it's IN the lease doesn't make it legal to BE in the lease or enforceable. Have you checked this out? Where's the metaphor police when you need them? I keed! I keed! I likely have more outstanding warrants than the rest of you all. Seriously, just about any reference to HVAC gets me thinking of the 2nd Law of Thermodynamics. And not the part about entrophy, but the part about how heat always runs from the hotter object to the colder. That works in physics, but not seemingly where psychic (in the Jungian sense, but on a society wide scale) energy is concerned. I'm just going to run away from the whole HVAC-related conceit and instead bring up one of my favorite sociological observations. Years ago I read a book where the main thesis was that America was a Borderline society, as in Borderline psychotic. And I would say that racism and related problems are just another feature of the greater disease. Well, that's what I am thinking right now. Best b'lee it's a full-blown and genocidal psychopathocracy. @SL. I did not know that. I am going to fight the good fight for BTU justice!